why is this pub on the website-its now flats! Who on earth sactioned the sale of the pub and gave planning consent to the flats is the lowest form of human life. A person with no soul who probably thinks being near a tesco metro and canary wharf is the greatest thing in the world. 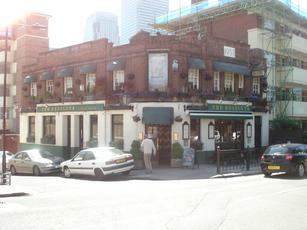 Poplar used to have character and this was a great pub and I'm very angry indeed. Apparently it is now up and running as a going concern. This is a medium sized corner pub along Poplar High St. It�s an inter-war pub it seems � the year on the outside wall proclaims it to be of 1937 vintage. Unlike the Greenwich Pensioner around the corner, it hasn�t all of its character ripped out of it, retaining what appears to be original wood facing to the counter as well as wood panelled walls. The furnishings consist mainly of settles round the walls, with normal tables and small stools, plus some high stools at the bar. The dark green carpet contrasts nicely with the dark wood panelling. There�s a dartboard, several TV screens on the walls and an array of games machines and one-armed bandits, etc. They had Tetley�s Cask and Adnam�s Bitter on. I had the latter, which tasted fine, and at �3 a pint I would say should be at the top end of the pricing structure for this area. They had food on, but I didn't eat there, nor look at the menu. There were only a handful of regulars in when I was there on a Friday lunchtime. All things considered this is a reasonable pub � not great and certainly not worth going out of your way to find, but certainly worth dropping into for a pint if you happen to be in the area.